Halloween is today!And, your friends of Disney•Pixar’s Inside Out want to celebrate with you! We have a “boo-tiful” photo gallery of last minute costumes and would love to see what you will be as well! 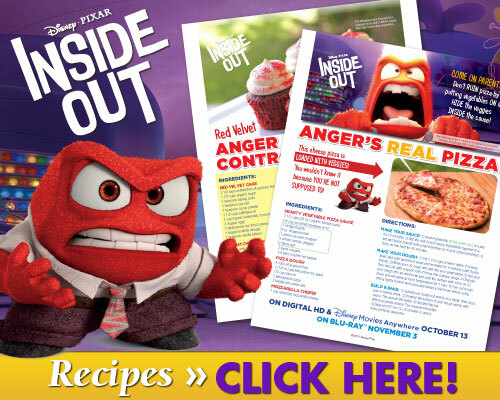 Extra candy corn points if you’re the characters of Inside Out! Additionally, as you attend or prepare your Halloween parties we have these recipes that will really call for a party in your mouth! Inside Out arrives on Blu-ray 3D™, Blu-ray™ Combo Pack and On Demand November 3rd! Wish I would have read this post earlier. My grandchildren love In and Out. Thank you so much for sharing this. So fun!! Im pretty sad I missed it!! I bet there were some amazing costumes!! We love the movie Inside Out! Win a Chance to Join Kristen Bell at the Premiere of BAD MOMS!